The apple tree is the most widely grown deciduous fruit tree in the U.S. This deciduous tree thrives during warm summers, but requires a period of cold dormancy to prepare for the following year’s fruit production. 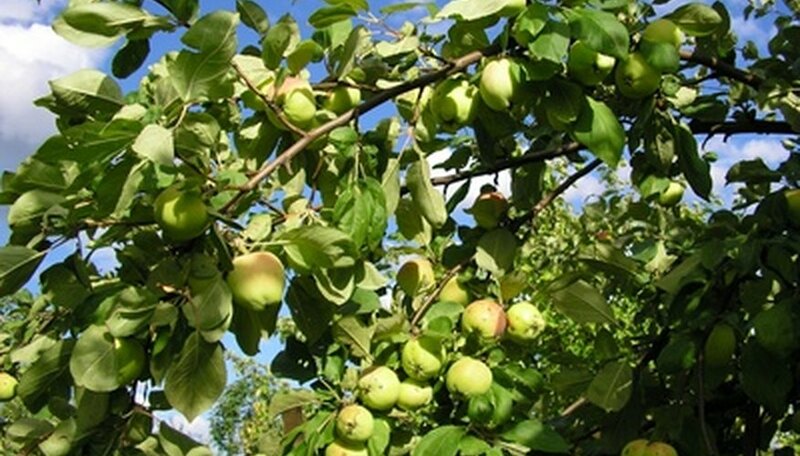 To successfully grow apple trees in East Texas, select the most favorable variety. East Texas averages 750 to 850 annual chilling hours, making the Red Delicious, Golden Delicious and Gala apple varieties ideal for the area. Identify a planting area for the apple trees. Choose a well-drained, nutrient-rich location that receives at least 10 hours of full sunlight each day. Ensure that there is ample room for a full-size apple tree. Select a location that positions multiple apple trees at least 20 feet apart. Plant the tree just after the final frost. Remove the apple tree from its bindings and gently remove the excessive soil from the root system. Soak the tree in tepid water for approximately 1 hour prior to planting. Prepare the bed for the apple tree. Dig a hole slight larger than the width and depth of the apple tree's root ball. Loosen any compacted soil to allow the roots to grow freely. Remove the apple tree from the water. Inspect the root system thoroughly. Trim away any broken or damages roots using sharp, sterile pruning shears. Position the tree in the prepared bed so that the graft union rests 1 inch above the planting surface. Fill the hole with soil and press the soil firmly around the base of the tree to secure its upright position. Irrigate the newly planted tree to eliminate air pockets and promote a good establishment. Prune the tree annually to develop a defined central leader and a strong framework. Use sharp, sterile pruning shears to complete the cuts at an angle. Prune interior branches and foliage to increase air circulation and light penetration throughout the apple tree. Feed the apple tree beginning one month after planting. Use a slow-release fertilizer with a 3-1-2 fertilizer ratio such as a 15-5-10. Distribute the fertilizer evenly around the diameter of the tree. Keep the fertilizer at least 12 inches from the trunk of the apple tree to prevent root burn. Water the fertilizer thoroughly into the soil with 1 to 1 1/2 inches of water. Feed the apple tree in the early spring, mid-April, mid-May and mid-June. Irrigate the apple tree deeply and frequently. Provide the apple tree with 1 to 1 1/2 inches of water each week. Use a slow-irrigation process or low-powered water hose to ensure a deep irrigation.